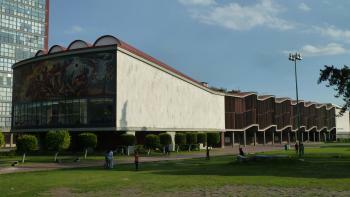 The Central University City Campus of the Universidad Nacional Autónoma de México (UNAM) is a prominent example of 20th century modernism. The complex was created by a team of more than 60 designers, following a master plan created by the architects Mario Pani and Enrique del Moral. Construction of the campus started in 1949. 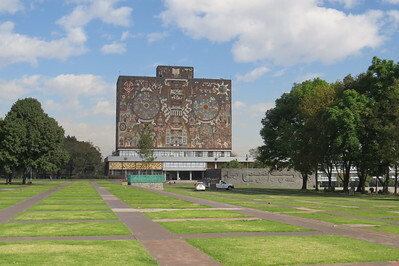 The site, which lies in the south of Mexico City, encompasses university buildings, sports facilities such as the Olympic Stadium, Cultural Center, Central Library and several museums. They are surrounded by vast open spaces, esplanades and gardens. In construction, modernist elements such as reinforced concrete were combined with local volcanic stone that is also prominent in pre-Hispanic structures. 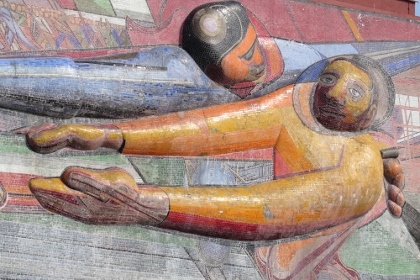 Murals in the main campus were painted by some of the most recognized artists in Mexican history such as Diego Rivera and David Alfaro Siqueiros. From the Copilco metrostation it is not immediately clear which way you have to go for the university campus. The station lies in a built up area and I did not see any signs directing to the UNAM. But I did notice lots of medical students in white coats, and decided to follow them. In about 5 minutes we duely arrived at the Faculty of Medicine, the first complex of the university area. It's a bit strange to walk here as a tourist as all other people around you are staff and students. But you can just walk in and the general atmosphere is very relaxed. The first great murals already are at this Faculty - rising up enormously behind your back! And at the edge of a basketball field where students were playing I noticed rightaway one of the more famous structures of the campus: the Cosmic Ray Pavillion by Felix Candela. There are no information panels or any other signs that will guide you around the university and I forgot to print out a map. That proved to be no problem though: from the Faculty of Medicine you just head out straight ahead and you will pass all the highlights and end at the Olympic Stadium. I started walking on the right hand side, and took in the other side on my way back to the metro station. The central area is occupied by a landscape garden designed by Luis Barragán. This part of the campus clearly has seen better times: the grass has been trampled over and over, and people walk their dogs there. It has plenty of benches to sit on, but a persistent smell of urine drove me away. Fortunately at the end of this large field the two most impressive buildings are located: the library and the rectory. The library is impressive from all sides. Its design is much Aztec-inspired and feels somewhat familiar after having seen the Templo Mayor in the city center yesterday. I finished at the Olympic Stadium. It really does look like the volcanic cone which it was meant to emulate. From the stadium I walked back to where I started, and passed several more interesting reliefs and murals. The whole place is a quiet getaway from the hustle and bustle of most of Mexico City, and to me it looks like a pleasant place to study. Fortunately it still is in active use as a university, I would not know what would have become of it when it has lost its purpose. We nearly missed this one, wandering through from Copilco metro station we were met by a series of locked gates, seeming to show the whole campus could was out of bounds. Fortunately a local shop employee was able to direct us to a back entrance. This meant our first impression wasn't that great, though the tatty looking student union office covered in revolutionary left wing leaflets and graffiti certainly did bring a nostalgic and knowing smile to my lips. Finally in the main precincts I was actually more impressed than I thought I would be. It felt familiar, however there was evidently something a little special about it. Obviously there are was the huge mosaics on the library. They are more intelligible as a history of Mexico up close, looking less like a giant owl than I had previously thought. However it was the quality of some of the other buildings that really grabbed me. My highlight was the post graduate centre and attached Auditorio Alfonso Caso elevated on slender piloti. The sheer amount of building sized mosaics dotted around the campus really started to make an impression. My wife reflected that this was the WHS she felt most "dragged" to Mexico City, however she was happy to see the large Rivera mosaic on the Olympic stadium across the road, and I got another tick on yet another list. If you are heading there outside term time try the entrance next to this stadium on ave. Insurgents as it seems guaranteed to be open. For me the quality of the modernist architecture was really impressive and elevated the site beyond just a standard university campus. I fell in love with this campus the more time I spent within its boundaries. Firstly, there are several dominant murals, but there are also several "hidden" ones that I stumbled across completely by accident. The buildings really compliment each other, and though often of eclectic designs really are stunning taken as a whole. During my visit, there were several students playing Quidditch. (Yes, that Quidditch!) The sky was blue, the weather was very pleasant, and I had all these structures and murals largely to myself. From Luis Barragan House, I continued my modernist journey to UNAM or Universidad Nacional Autonoma de Mexico, another UNESCO listed modern architecture site in Mexico City, by metro. I started from Copilco Station, but since I arrived almost 5 PM, there were no students for me to follow for direction; I had to walk to the direction where students came from instead. Luckily I found the gate of the university and the car park area of Faculty of Medicine. The university was in full swing with late evening activities like group studying, meditation class, English club, drama play rehearsal, soccer, basketball etc. At first I was quite awkward to walk around as I felt that it was not a place for tourists, but after watched those students for a while, it reminded me my university or even high school times, and that made the visit more personal than I thought. The first interesting building I saw was the Cosmic Ray Pavilion, since there was a basketball competition on the foreground of this interesting looked building, the whole area was full with spectators and team supporters, so I only saw the pavilion from the other side of basketball field, but still I was able to admire the nearby giant mural of Franciso Eppens, the corn is probably the think that I like most from this mural. The next one was the mural at auditorium; personally I did not like this one for its strange depictions, but it is still a nice art. Then I was in the large open area, the most impressive site I saw was the very long building for university classrooms, this building probably the longest university building I have ever seen. The famous central library building and the Rector Tower were my next places to see. These two buildings and surroundings are the true highlight of my trip. The library wall is really beautiful with pre-colonial style mural, while the mural on the rector tower is very eye-catching. I also impressed the stone walls and stairs that look like the ancient ruins of Maya or Aztec. Then I crossed the street and saw the really interesting designed Olympic Stadium. 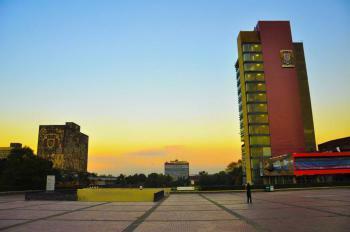 All in all, UNAM is a collection of nice designed buildings with interesting art works. The building complexes in some aspects look very strange as I believed all those architectures who designed the building tried to put their signatures at least in one building, resulting in an interesting mix of many types of modernism from straight lines, curve and cubic forms, but strangely that it turned out to be harmoniously look good. The mural arts also help the university complex looks more interesting than other modern styled universities. Anyway if you are not interested in architecture or plan to study here, visiting UNAM is just a strange idea to travel far from Mexico City centre to see university, but again if people can travel from London to see university in Oxford and Cambridge for beautiful buildings there, UNAM which is equally impressive but in the different architectural style can be a good idea, so why not? Although it was only inscribed in 2007 it is somewhat surprising to see that this easily accessible site in an easily accessible city still hasn’t been reviewed almost a year later. When I first visited Mexico City in 1971 it was inconceivable NOT to go out to see it, since the Library building in particular, with its O’Gorman mosaics, was a world famous iconic building occupying much the same space in “world consciousness” as the Sydney Opera House does today. However, much time has passed since those days only 3 years after Mexico hosted the 1968 Olympic Games and had received a degree of exposure since unrepeated (Indeed the Olympic stadium is part of this inscription). I had felt unable to do a review based on visits 36 and 25 years earlier but went back yet again during our trip round Central Mexico in Mar 2008 to assess how time had treated both the site and my perception of it. “Modern” architecture (if a building designed at the start of the 1950s can be described as “modern”!) tends in my experience often not to survive time particularly well – either physically (e.g one cries to see the state of the buildings in Brasilia) or aesthetically. But we visited on a sunny Saturday morning, the concrete was light, the grass was green and the Jacaranda trees were in full flower – the architecture was being given a helping hand by nature! Students in cloaks and mortar boards were lining up, presumably for graduation ceremonies – a reminder that a complex such as Ciudad Universitaria should really be measured against its prime function of providing a good environment for study and research rather than in terms of its “architectural wow factor”. Only alumni and current students could comment on that but on this sunny day I certainly didn’t find the place “oppressive” despite its size – the walking distances were not too great and buildings’ external condition looked reasonable without too much flaking concrete. Much of the architecture - low concrete buildings with a lot of pillars, covered walkways and the occasional cantilevered lecture theatre - reminded me of my own UK university buildings from the late 1950s. Unless you are particularly interested in this sort of structure or in the planning of such complexes then the main reason you would go would be to see the more famous buildings – unremarkable boxes in themselves but made “iconic” by the art work which covers them. 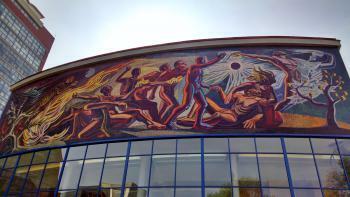 First the Refectory, with its “sculptural painting” by Siqueiros titled “The People for the University. The University for the People” (photo). Today its social realism and overt support for a discredited political systen makes it seem very passée. (Siqueiros was jailed for leading a failed attempt, using machine guns and explosives, on the life of Leon Trotsky and was later to receive the Lenin Peace Prize!). 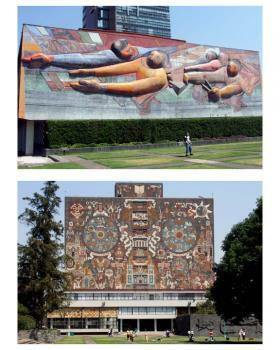 On the other hand O’Gorman’s mosaics on the Library (photo) are very “Mexican” – and that perhaps is the problem. Now its novelty has passed, this building is situated in an architectural cul de sac of its time and country which didn’t really lead to other things (whereas eg The Sydney Opera House speaks a universal language and heralded the use of new shapes in architecture). For us this had already been a “holiday of murals” and we had seen what we felt were better, more powerful/memorable works by Siqueiros and O’Gorman (see later) as well as Rivera and Orozco elsewhere in the city and in other buildings in Central Mexico. whilst Siqueiros has work there as well and also in the T List site of San Miguel Allende (in the "Bellas Artes")!! 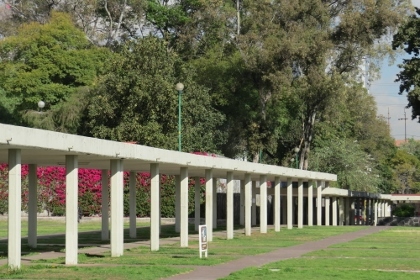 Reinforced Concrete: "The campus (referred to as the CU: Ciudad Universitaria, or "University City") is an urban enclave within which buildings are compositionally placed upon a large pedestrian open space. 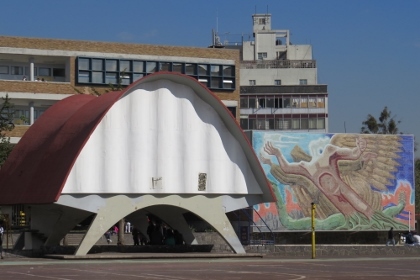 In addition to a canonically Modern spatial and programmatic distribution, the high architectural quality of its reinforced concrete and masonry buildings earned the CU a classification in 2007 by UNESCO as a World Heritage site,"
Mathematical Concepts: Pabellón de Rayos Cósmicos - Hyperbolic Paraboloid. Hyperbolic paraboloid is a doubly ruled surface shaped like a saddle. "Cosmic Ray Pavilion is the product of the structural experiments of the architect Felix Candela is a very thin reinforced concrete double curvature based on the geometry of the hyperbolic paraboloid." Botanical Gardens: Jardin Botanico Faustino Miranda. Belonging to the Institute of Biology. Situated south of the Olympic Stadium in the "Ecological Zone". Built in the 20th century: Completed in 1954.